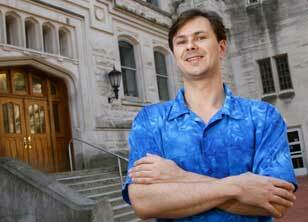 IU theoretical physicist Nikodem Poplawski in research published in “Physics Letters B” uses Euclidean-based mathematical modeling to suggest that all black holes may have wormholes inside in which exist universes created at the same time as the black holes. In studying the radial motion through the event horizon (a black hole’s boundary) of two different types of black holes — Schwarzschild and Einstein-Rosen, both of which are mathematically legitimate solutions of general relativity — Poplawski admits that only experiment or observation can reveal the motion of a particle falling into an actual black hole. But he also notes that since observers can only see the outside of the black hole, the interior cannot be observed unless an observer enters or resides within. 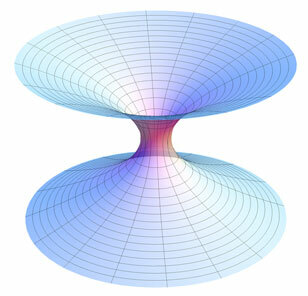 A white hole is connected to a black hole by an Einstein-Rosen bridge (wormhole) and is hypothetically the time reversal of a black hole. Poplawski’s paper suggests that all astrophysical black holes, not just Schwarzschild and Einstein-Rosen black holes, may have Einstein-Rosen bridges, each with a new universe inside that formed simultaneously with the black hole.